I am not vegetarian. Not even close. But sometimes I do want a completely vegetarian day – usually when I’ve over indulged on the day before – and since yesterday I spent the evening eating pork in very large quantities at the Greatest Pork Event, today was one such day. Having said that, I can’t bring myself to look at the pictures of yesterday’s feast – I did try and it just made me feel too hungry on a 5:2 fasting day. So you’ll have to wait a bit for my review! My initial plan was to make a fish or chicken stirfry for today’s 5:2 diet meal. But, the combination of too much meat yesterday and some rather nice looking baby pak choi in the supermarket on offer convinced me to make this a meat free day. Breakfast was half a pot of 0% greek yoghurt with a handful of raspberries (about 60 cals) and I have been drinking green tea all day, with one diet cup-a-soup when I got the munchies a bit earlier this afternoon (60 cals). So, that leaves me up to 380 calories for supper. 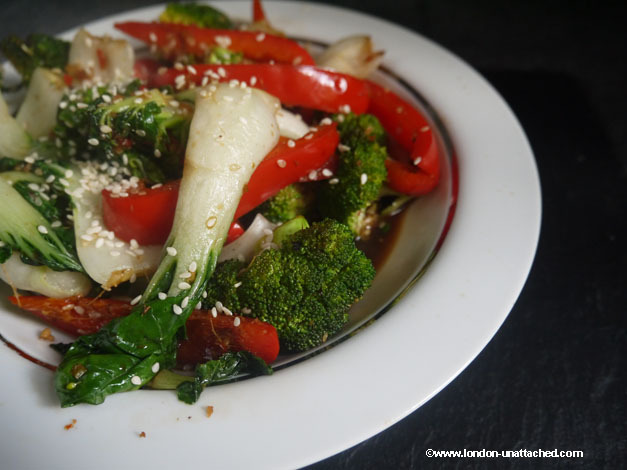 This recipe used 200g broccoli (68cal), 100g pak choi (13cals), 150g red pepper (50cals). The sauce was a teaspoon of mirin, a teaspoon of soy sauce and a mix of ginger, chilli and garlic (around 50cals). And, I used a teaspoon of sunflower oil to stirfry (40 cals) and finished the dish with a teaspoon of sesame seeds (about 20 cals). A total of 241 calories for a very filling hot dish and easily within my allowance. I could have allowed myself some boiled rice, a little chicken or some fish. Instead I am thinking that I might have a snack before bedtime because one of the worst things about a low calorie diet like the 5:2 diet is going to bed feeling hungry and then not being able to sleep. 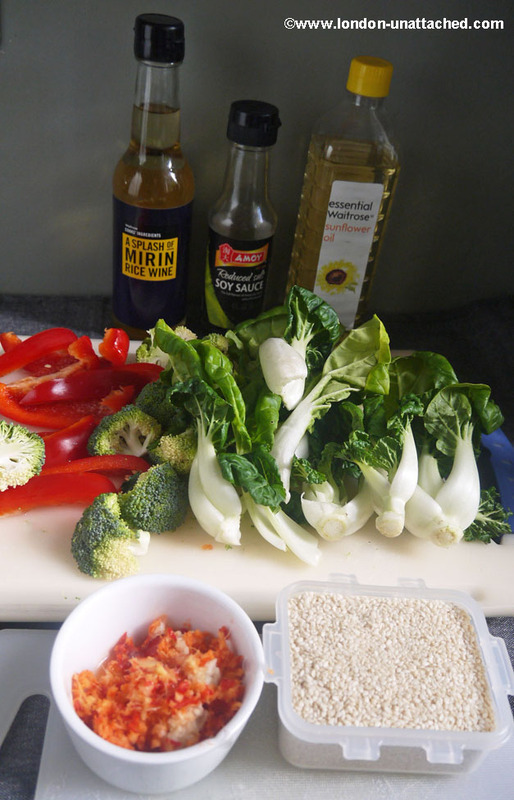 One of the most important things when you are making a stir-fry is to do a good mise-en-place before you start cooking. Nothing is going to take long to cook and you DO need to stir constantly to stop things burning. So, get everything chopped up and all the ingredients you plan using out before the oil hits the pan. I’ve listed the vegetables I’ve used for this dish, but it is something where personal taste, what you have in your fridge and what is in season should influence what you use. I particularly like asparagus tenderstem broccoli, mange-tout and pak choi. And of course you can add in meat or fish to taste. I would generally cook any meat/fish for a minute or so in the spiced oil before adding in the vegetables and then add in whatever vegetables I am using in order of size and ‘firmness’. Something like carrot or onion needs to go in early on…whilst spinach and pak choi go in right at the end. 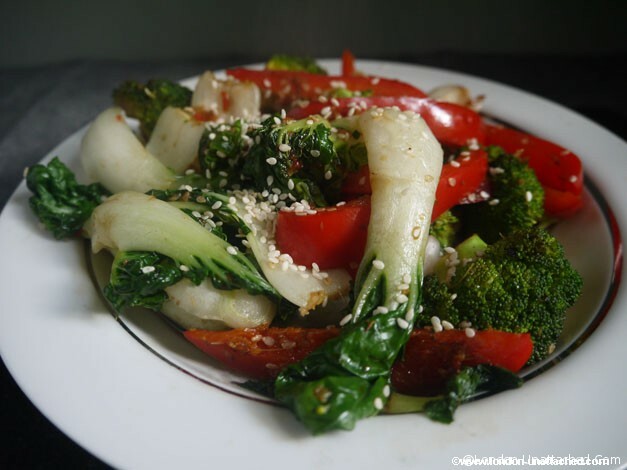 Dishes like this stir-fry are useful in any diet for a number of reasons. Did you know that certain spices have thermogenic properties? They literally speed up your metabolism and help you burn calories faster. Some of the herbs and spices are: chilli pepper, horseradish, mustard, cinnamon, fennel seed, garlic, ginger, ginseng, guarana, and turmeric. And of course, a vegetable stir-fry DOES mean you are getting plenty of vegetables. Stir-frying, so long as you don’t lace the dish with sweet heavy sauces or use a lot of oil to stir fry with, is a healthy way of cooking too, because the vegetables are not overcooked (which destroys some of the vitamin content). Today was my first experience of feeling really hungry on the 5:2 diet. It has nothing to do with the fasting element as I was hungry before I ate my main meal. On previous days of following the 5:2 diet, I’ve felt fine through the day, just the odd hunger pang which I’ve overcome with a little diet coke or a cup of coffee. I suspect it was down to the amount I ate the day before and I do wonder if it’s easier to do the 5:2 diet using consecutive fasting days. From the point of view of my lifestyle, that’s not always possible, but, at some point, I will try two consecutive 5:2 diet fasting days and report back. I’ve found that I can create a tasty “stir-fry” by making a broth first using a little water, ginger, garlic, chilli and soy etc. Add the onions and poach until soft then add the veg in stages to “steam” cook them. Just add the thickest ones first. The oil in recipes tends to add quite a lot to the calorie count especially when you are trying to work to such low calorie levels. Just wondered if anyone else has had success in this way?